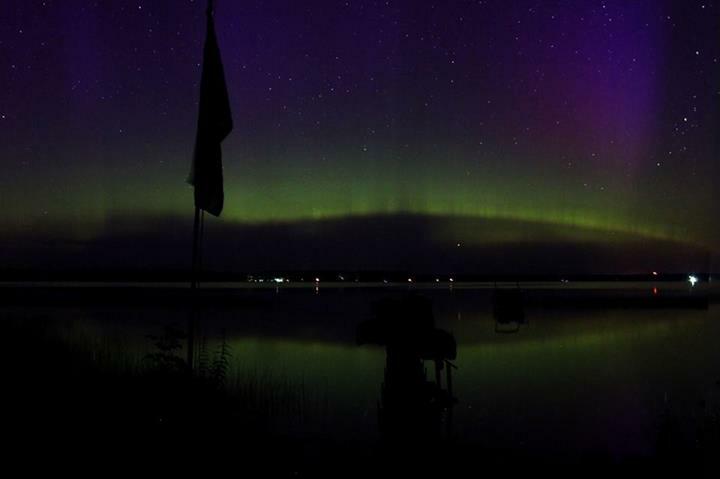 Pavlica’s South Shore Resort is virtually the only vacation resort on the southern shore for vacationers to take in the Aurora above South Manistique Lake’s glistening waters. On a very special night in July, 2013 (which also happens to be the date we bought the resort) the Aurora Borealis was as mesmerizing as ever with a brilliant spectrum of colors from Green to Red to Violet to Blue reaching high into the night sky. The photo above is proof of the experience taken directly from Cottage #3’s front porch. The sun has reached Solar Maximum in it’s 11-year cycle and there’s no better time this decade to visit Michigan’s Upper Peninsula and take in the Lights. Solar Maximum will last another year or two so you still have time to book your cottage for 2014 and 2015. Of course, the Northern Lights can be visible at any point in the Sun’s 11-year cycle even when the Sun is less active. Word to the wise: When booking your stay, take a look at the upcoming Lunar Schedule. Find a week when the moon will be in it’s “New” phase to avoid a “Full” moon which would pollute the sky with light. The best shows feature a sky with the least amount of moonlight possible. If the Northern Lights don’t make an appearance, you’ll still be able to revel in the trillions of visible stars in Northern Michigan’s fabulous night sky. Another tip: As your vacation approaches, check out spaceweather.com for information on the Sun’s current weather patterns. If a large solar flare erupts a couple days before your arrival, you’re in luck! The flare takes 2-3 days to travel through the solar system before it effects the earth. That’s when the magic happens. Click on over to our Shop and you’ll find the featured photo above available in various print sizes in all it’s High-Resolution glory. Thanks for visiting and we hope to see you soon at our cherished Curtis, Mi Vacation Resort!